Rum Cake – A delicious bundt cake made from scratch and then soaked with a butter-rum syrup. Not for the faint of heart! It’s cake time! I don’t make cakes often, because, frankly, I’m not a huge fan of cake. It can be dry and blah and I dislike more cakes than I like them. But there have been two cakes in the past year that have changed my life – this cream cheese pound cake and these Nutella crunch cupcakes. And they both had the same quality in common: they were unbelievably moist! Moist cake has the ability to move mountains and change minds. And it certainly did for me. Today’s cake recipe falls into the same category: moist moist moist. I first fell in love with this cake at a friends wedding in Miami. Her wedding cake was made with rum cake and I could not stop eating it. It had the best texture and moisture and that rum flavor! Holy moly! So I just had to give the recipe a try for myself. So here it is – my version of classic Rum Cake! Rum cake isn’t just regular cake with a little rum. There is added cornstarch and milk powder to help the cake get that extra moisture we need that’s also perfect for absorbing the rum sauce without getting crumbly and oversaturated. Oh and that rum sauce, y’all…It is quite strong. I had to even reduce it by 1/3 from the original recipe because it was too much for me. But I think I’ve kept just enough in there to add the perfect amount of boozy flavor. But feel free to add more if you’re feeling up for it! Bundt pans can be a pain to use if you don’t grease it properly. You don’t to spend all that time making a cake that won’t leave the pan! So make sure to get grease in every nook and cranny of your pan. This recipe calls for dry milk powder. This was a new ingredient for me and might be for you, too. But it was pretty easy to find at my local grocery store. It was in the same aisle as the condensed milk and evaporated milk. I used Jamaican dark rum for this cake to give it the right flavor. I’ve seen recipes that use either, but I highly recommend dark rum. Once the cake is done baking and has cooled for 10 minutes, we have to remove it from the bundt pan, clean the pan, and add it back to the pan so we can add the rum sauce. I like keeping the cake in the pan to add the rum sauce so it can trap all the sauce into the cake. However, cake baking 101 says we cannot keep cakes in a pan for too long or else the grease will act like a glue and hold on to the cake. That’s why we have to clean the pan first before adding the cake back to it. There you have it – my new favorite cake recipe! How long can you wait before making this?? I bet not too long! 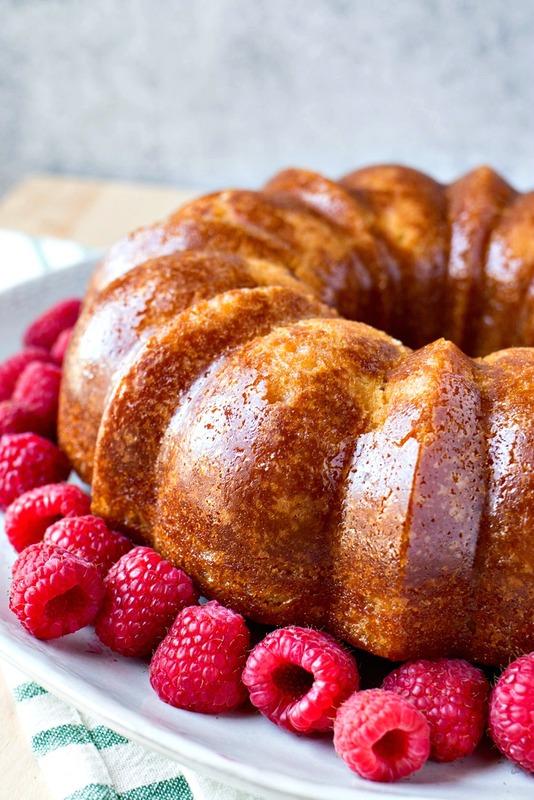 A delicious bundt cake made from scratch and then soaked with a butter-rum syrup. Not for the faint of heart! Preheat oven to 325 degrees. Spray your bundt pan with non-stick cooking spray. Make sure there's grease in every nook and cranny. Mix together the dry ingredients in a large bowl - flour, dry milk, corn starch, baking powder, and salt. Set aside. In a large bowl fit for a stand mixer and paddle attachement, add butter and sugar and cream together until a paste forms, about 3 minutes. It won't get light and fluffy like it does for cookie batters. That's okay! Add dry ingredients and mix on low. The mixture will turn to crumbs. In the bowl that was used for dry ingredients, add oil, milk, eggs, and rum. Whisk together. Add to the dry ingredients in stand mixer and beat on low to combine. Scrap down the sides of the bowl to free up any un-mixed sections. Pour batter into prepared bundt pan and bake for 40-50 minutes or until toothpick comes out clean once inserted. When there is about 15 minutes left on the timer, begin the rum sauce. Add butter, water, sugar, and salt to a medium saucepan and set over medium heat. Bring to a roiling bowl and then remove from heat. Add rum and stir carefully because the rum will cause sauce to boil. Let cake cool for about 10 minutes in cake pan. Then remove from pan and let it sit on plate while you clean pan to remove crumbs and grease. Add cake back to pan and poke with holes ll over using a fork or skewer. Pour sauce over cake very slowly. Let cake sit for 1-2 hours so it can absorb all the sauce (but not longer or it will get stuck in pan). Invert cake onto a plate and serve. I love making bundt cakes! And that’s so interesting that your friend had a run cake for her wedding cake! Yay! I hope he love it! This looks absolutely delicious! Thanks for sharing. I too have the same problem with potentially dry cakes. Love the presentation with the raspberries. Love the richness of this cake. It looks so moist. A friend of mine used to make rum cakes for Christmas gifts. I’ll have to carry on the tradition with your recipe! Thanks so much! What a great gift idea! I definitely love rum cake! It has such awesome flavor. This one is calling my name! I agree with you that cake has to be super moist. This looks like it definitely fits the bill and then the rum of course has to take it over the top. Yum! Your rum cake looks moist and delicious! I love the crumb to it! I love making rum cake year round and look forward to trying your version. And yes, bundt cakes are tricky to grease! This sounds soooo good…esp the Jamaican dark rum part. I’m feeling all the yumm with this one. Pinning now!